I'm initiating coverage of Liechtenstein by starting at the end, and going to the "back-of-the-book." Often, "B-O-B" items with low printings prove to be sleepers, because they are initially neglected by collectors who later seek them out in order to fill their empty album spaces. 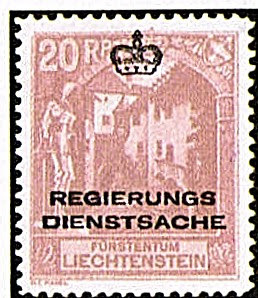 In 1932, Liechtenstein issued its first Official stamps by overprinting its regular issue of 1930 (Scott #O1-8). Only 14,300 sets were issued, and Scott '11 prices the unused set at $ 238.50 ($700.- for NH). All of the early Liechtenstein Officials sets are good, but this set and the second, 1933 set (Scott #O9-10; CV =$ 200.-; 15,979 issued) are extremely undervalued. Liechtenstein is one of Europe's smallest countries, but it's stamps are very popular worldwide, especially in Switzerland, Austria, and Germany. I recommend accumulation of the country's better items in anticipation of a European economic recovery. In 1954, Japan issued a 10 yen stamp picturing Kannon, or Guanyin, a bodhisattva venerated by Buddhists and associated with compassion (Scott #580). 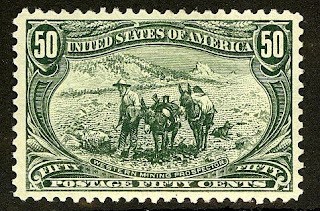 The stamp was issued in booklet form (Scott #580a), and only 60,000 booklets were issued. Scott '11 prices the unused booklet at $175.- . 10 yen was a lot for the average Japanese to spend on a stamp in the early '50s, when Japan was still just beginning to recover from the depredations of World War II. It is likely that most of these stamps were simply used to pay the postage on parcels, and that many of the booklets collected were originally purchased by foreigners. I've no doubt that Japan's economy will eventually rebound after having been hit by the recent horrific earthquake, tsunami, and nuclear disaster which caused so much devastation. Japan is the third largest economy in the world (after the U.S. and China), and has a large and active stamp collecting community. Furthermore, the Kannon booklet has worldwide appeal as a Buddhist Religion topical. There are hundreds of millions of Buddhists in the world, many of whom live in the rapidly developing countries of East Asia, and there is little doubt that Buddhist Topical stamps will grow in popularity over the long-term. Note that these booklets are often found with minor condition problems, especially gum bends and perf separations. Try to buy a one that's clean and fault-free. 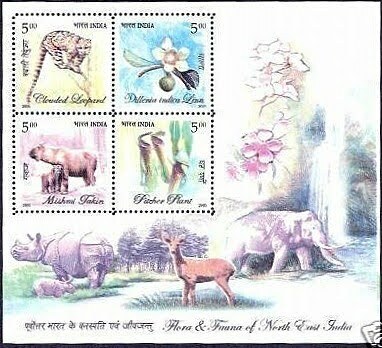 In 2005, India issued a miniature sheet picturing animals and flowers (Scott #2101a). 100,000 were issued, and Scott '11 prices the unused sheet at $11.00 . Over the last decade or so, India has issued a number of souvenir sheets in quantities of 50,000 to 100,000. I intend to recommend some of them in future articles. While India's stamp market is heating up, the process has been more gradual than that of its neighbor, China. Had a comparable popular topical souvenir sheet been issued there it would probably retail for at least 50 to 100 times the current cost of this Flora/Fauna sheet. 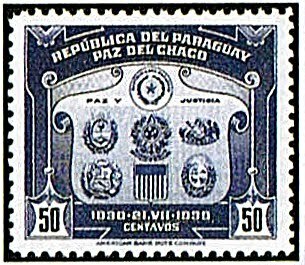 In 1939, Paraguay issued a compound set of sixteen stamps commemorating the First Buenos Aires Peace Conference (Scott #355-61, C113-21). This set was issued in the aftermath of the Chaco War, a pointless and bloody territorial conflict between Paraguay and Bolivia, ignited in part by the issuance of postage stamps by these countries showing maps with different boundaries. 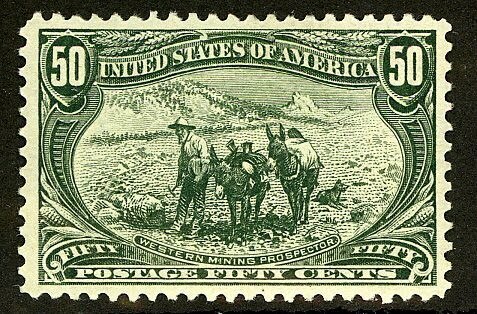 Only 5,000 sets were issued, and Scott '11 prices the unused set at $42.30. The set should do well based on the growth of stamp collecting in Paraguay as well as interest in Latin American stamps in general. It is a memorial to the tens of thousands of soldiers who died needlessly in the war, and brings to mind Voltaire's comment: "The only way to comprehend what mathematicians mean by Infinity is to contemplate the extent of human stupidity." With about 6 1/2 million people, Paraguay is an emerging market nation with the potential to become a major agricultural exporter. Its subtropical climate allows for 5 harvests every 24 months, and it has vast tracts of virgin arable land. In addition, manufacturing has shown strong growth in the production of edible oils, garments, organic sugar, meat processing, and steel. Annual GDP growth has averaged 4.5% over the past 5 years, and was steadily increasing until it experienced a recent slight decline due to the global financial crisis. I have begun a new blog, "The Stamp Specialist", which will feature my buy prices for stamps which I am interested in purchasing. I've just posted a buy list for Paraguay, including the souvenir sheet recommended in this article. Viewing dealers' buy lists every now and then is an excellent way to keep current on the vagaries of the stamp market. 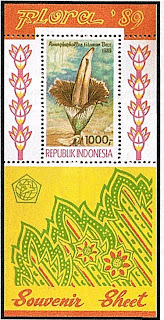 In 1989, Indonesia issued a set and souvenir sheet picturing flowers (Scott # 1376-77, 1378). Only 20,000 of the souvenir sheet were issued, and Scott '11 prices it unused at $35.00. 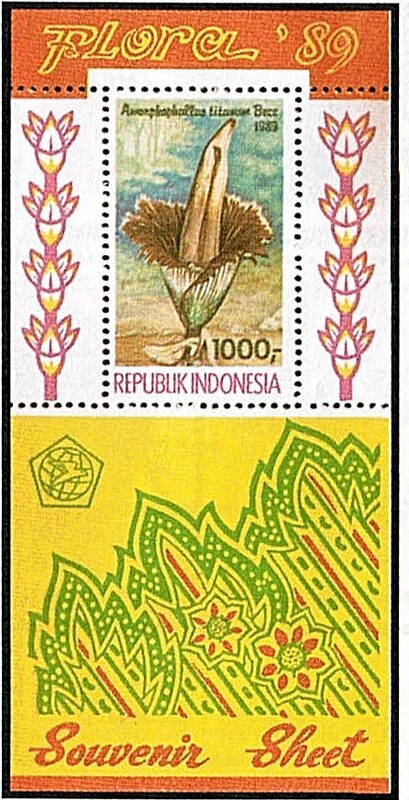 Flowers are a very popular collecting topic, so demand for this issue should continue to grow on that basis alone. As a country emerges from Third- or Fourth World status and begins to develop a middle class, its domestic demand for goods and services becomes more variegated and complex. Whereas previously, the vast majority of its population was mainly concerned with survival and alleviating the miseries of poverty, it now has far more time and money to invest in recreational activities. Hobbies, such as collecting stamps, take root as effective means of enhancing the quality of life and alleviating the boredom and stress that are byproducts of the society's increased affluence, competitiveness, complexity, confusion, dynamism, and social mobility. As a stamp market develops within an emerging market country, it undergoes several transformative phases which reflect the evolution of demand within the country's philatelic community. Obviously, each country represents a separate case, with its own unique set of circumstances which affect its stamp market. Nevertheless, some useful generalizations may be made regarding emerging stamp markets, and these may be helpful when projecting demand trends for particular categories of stamps. 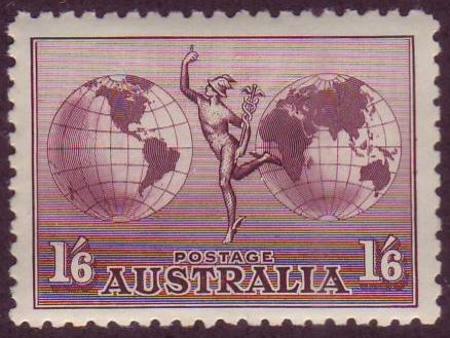 During the "prologue" state of an underdeveloped country's stamp market- its "zeroth" phase- before the country begins the transition to a middle-income economy, most of the demand for its stamps comes from three groups of collectors: members of the country's wealthy elite, foreign specialists, and worldwide topical collectors. The first two groups are similar, in that both tend to be small and both may collect the country as a whole, but also focus on rarities, varieties, and obscure items. The third group, topical collectors, will only purchase those issues which fall under their chosen topical areas. Demand among the first two groups for better stamps of the country tends to be either static or gradually increasing, although it may be bolstered if investors who view the country's stamps as undervalued join the fold. Topical demand growth will, as always depend upon the popularity of the topic. The initial phase in the development of a country's stamp market is marked by the a general focus on regular issues and commemoratives as well as the growth in interest in topicals related to the country's culture and prominent national figures. Beyond airmail stamps and semi-postals, there is not much emphasis on back-of-book items at this stage. Often, either no specialized catalogues for the country's stamps exist, or if they do, they are decades old and out-of-print. The appetites of "arriviste" collectors in newly developing nations are often as indiscriminate as they are voracious. India's stamp market provides an example of a rapidly growing collecting community where almost none existed before, and in which many of the new collectors are adults who did not have the means or opportunity to collect as children. As a consequence, it has seen an explosion of demand for flashy items which were once considered wallpaper, such as minor errors on Indian stamps and modern Indian First Day Covers. Adult neophyte collectors are far more common in the developing world than in affluent countries in which most adult collectors began as children, and this phenomenon can strongly influence demand. The second stage is characterized by the beginnings of specialized collecting, as collectors' interests expand to include varieties and back-of-book items, such as special delivery stamps, postage dues, officials, parcel post stamps, etc.. Often when a country's stamp market reaches this stage, dealers or specialists publish specialized catalogues and albums for the country's stamps, where either none existed before or those that did exist were long out-of-print. The expansion of interest in formerly neglected back-of-book items is sometimes accompanied by dramatic increases in the values of these items. Extending specialization further, the third stage (which may be viewed as incorporating all of the later stages) is characterized by enhanced interest in postal history, ephemera, and "back-of-back-of-book" items, including quasi-cinderellas, such as locals, carriers, savings stamps, revenues, etc.. Once again, obscure items which had almost no value in the initial stages come into the limelight of collector interest. The important lesson to draw from this is that when one wishes to profit from the development of a stamp market, it is often a good idea to think ahead by buying neglected oddball items which no one cares about yet, if their value might be enhanced due to trends toward increased specialization. Just as stamps of many formerly poor emerging market countries were once been considered wallpaper, the peripheral items of these countries that are considered junk now may be worth considering. 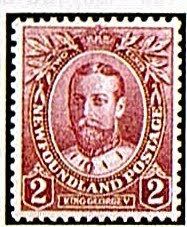 In 1911, Newfoundland issued a set of eleven stamps portraying members of the British Royal Family (Scott #104-14). 20,000 were issued, and Scott '11 prices the unused set at $285.- ($500.- for NH). Aside from being an undervalued B.N.A. issue, it has the added appeal of being the quintessential Royal Family topical set. As a popular topic for British Commonwealth collectors, it's hard to beat the Royal Family, with a stick, sceptre, or other appropriately heavy object, and banking on such loyalty can pay interest. Before the unification of Germany, the country was divided into states, many of which issued their own stamps. A few of these stamps are rare and extremely valuable, but in many cases, prices of German States stamps have lagged, because as a collecting area it is a minefield of reprints, fakes, and forgeries. 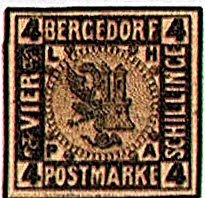 With the exception of the rarities, many German States stamps often can be purchased in F-VF+ condition for 25%-35% of Scott. Better items which seem questionable should be purchased conditional on obtaining expertization, preferably by a reputable German expert. Bergdorf issued its first and only set, picturing the Arms of Lubeck and Hamburg, from 1861-67 (Scott #1-5). 80,000 sets were issued, and Scott '11 values the unused set at $137.50 . The stamps are considerably pricier used. Unfortunately, counterfeit cancels abound, as do reprints, and the unused stamps are not valuable enough to justify obtaining expertization. As is often the case, the ubiquity of fakes has dampened the market for the authentic examples, and the best strategy in such a situation is to purchase the stamps conditional on obtaining expertization and in a form which is expensive enough to justify it, such as either buying the stamps in strips or blocks, or buying them used, preferably on cover. Having taken that necessity into account, however, I believe that the set will do well over time. Germany, an affluent nation of about 82 million people, is the world's fourth largest economy, and both the second largest importer and second largest exporter of goods. Since the age of industrialisation, the country has been a driver, innovator, and beneficiary of an ever more globalised economy, and is recognised as a scientific and technological leader in several fields. Annual GDP growth has averaged about 2% over the last five years, reflecting the recent global slowdown, and the gradual progress being made in absorbing the less developed former DDR. Germany has long been known as a center of philately, and both the hobby and the stamp business there exhibit a markedly higher level of sophistication than what exists in the U.S.. There are three million philatelists in Germany, which makes it the second biggest stamp collecting nation in the world. In 1934, the Italians issued an airmail semi-postal set celebrating the 65th birthday of King Victor Emmanuel and commemorating the first non-stop flight from Rome to Mogadishu (Scott #CB1-10). 10,000 sets were issued, and Scott '11 prices the unused set at $129.00 ($320.- for NH) . The set has potential dual market appeal to collectors of Italian Colonies/Possessions and collectors of Libya, and should do well based on growth in Italy and Area collecting alone. Libya has been in the news quite a bit lately, and it is unclear how and when the current crisis will be resolved. A nation of about 6.4 million people, it depends mostly upon oil exports, and has reserves in excess of 44 billion barrels of oil and 54 trillion cubic feet of natural gas. However, the country's not so lovably eccentric authoritarian dictator has siphoned off much of the wealth and distributed it to family members and allies, while keeping his subjects in line by giving free expression to a minimalist conception of human rights. Annual GDP growth has averaged 5% over the last 5 years, and with a little luck, more of that prosperity will be spread among the Libyan people in the future.